I highly recommend this conference which is put on every two years. Lisa Gardner gave a great workshop on how to focus in on your career and figure out what you're doing. Jennie Cruisie and Bob Mayer did a 2-hour workshop on how to start a novel--finding characters and conflicts and story. Debbie Macomber was the keynote speaker--she is so funny! Now I'm trying to clear my head and get back to work. I have revisions due to Berkley, need to do a tiny edit on the vampire novella, and of course write another book! (or two). I found out today that PENELOPE & PRINCE CHARMING is now #13 on Barnes & Noble's bestseller list!! And, it made it to #68 on Bookscan! I am stunned and so happy. This book was a labor of love, that's for certain. A whole lot of labor and a whole lot of love. Glad to hear it's being enjoyed. Turning the Pages of Romance Conf. I had a wonderful time in Lincoln Nebraska at the Turning the Pages of Romance Conference put on by the Omaha and Lincoln city libraries. I love libraries who support romance. They worked very hard to make the conference a success and it showed. The keynote speaker was Rachel Gibson, then we had breakout sessions with groups of authors, and all authors at one time or other through the day participated in a Q&A with readers. We also had a booksigning, so great shopping on top of it. My editor let me know that Penelope & Prince Charming made Number 37 on Barnes & Noble for it's first week. Too cool!! My first bestseller list! Thanks to everyone who has written me, I appreciate it! My editor tells me we'll see the cover of Alexander's story, The Mad, Bad Duke very soon. Of course I'll post it! This weekend, I'll be at the "Turning the Pages of Romance" conference in downtown Lincoln, Nebraska put on by the Lincoln City Libraries. I'll be on panels and signing books. It sounds like fun, and I love the fact that the library is sponsoring it. I adore libraries--they started me reading when I was tiny. 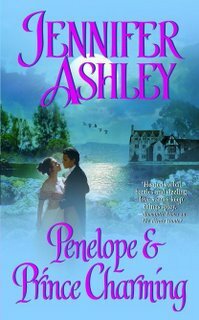 Penelope & Prince Charming is officially out today! I saw it in bookstores this weekend so it's really been out a few days, but this is "official" :) The cool thing is, I mailed off the sequel The Mad, Bad Duke this weekend so it was another in-and-out for me. This book got a 4.5 star review from Romantic Times, not an easy grade to get. It's steamy! Enjoy.